The closer it gets to Christmas, the more anxious I get. I’m such a procrastinator and have waited around thinking, rethinking and overthinking what I want to get for my loved ones this Christmas. And since everyone has such unique tastes, I have to special order all the gifts by tonight and cross my fingers that it gets here by Christmas eve. Hopefully next year I’ll learn and plan early, although I highly doubt it. To help keep things running smoothly during this of so busy time of year, I like to make simple , healthy recipes with fresh local ingredients. While the rest of the country is cold and frigid, our mild temperatures here in the sunshine state allow for wonderful fresh produce all the way through winter. It’s easy to find local fresh fruits and vegetables in grocery stores, at farmer’s markets and at restaurants, so it’s easy to buy and eat locally. Eating fresh, seasonal items means things are fresher and tastier, the nutritional value is optimized, and it encourages a diverse diet. And the best part about eating local is that it’s cheap. You can always find the local freshest produce on sale because there’s such an abundance of it. 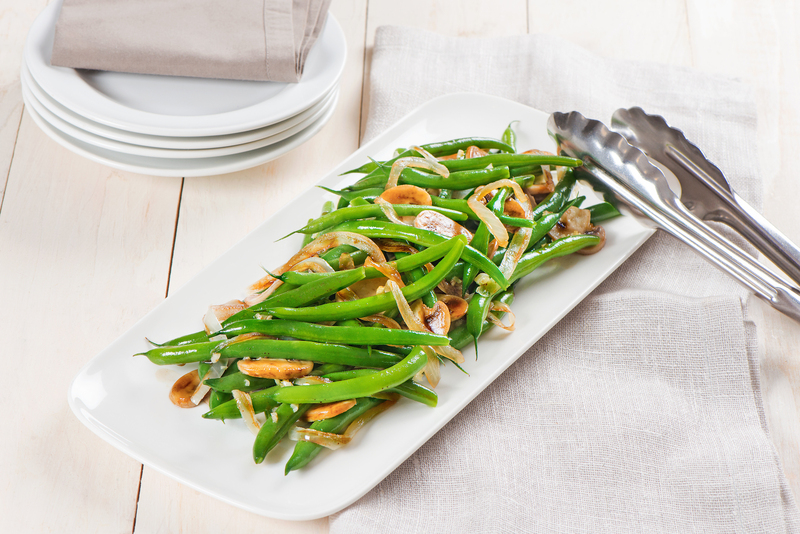 For this recipe I used fresh Florida green beans and local mushrooms. I found Florida Green Beans and/or Squash at amazing prices today at the grocery store. I just couldn’t pass them up. 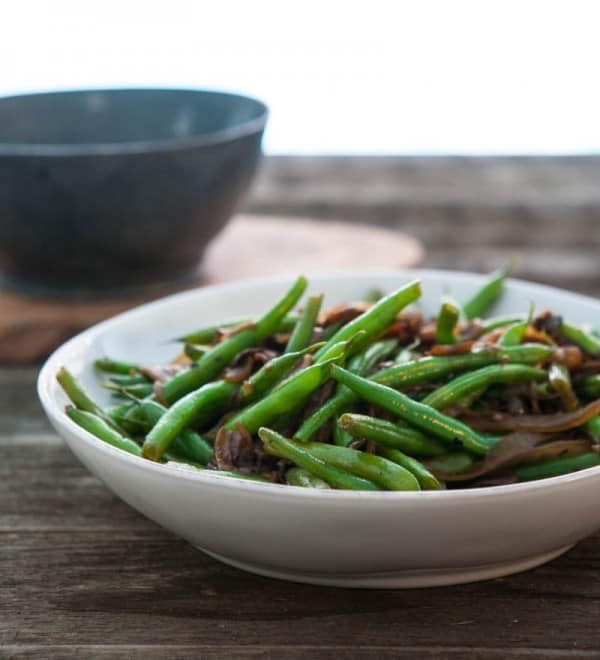 After I got home I found this great recipe for Florida Snap Beans with Caramelized onions and Mushrooms on the Fresh From Florida site. My whole family loved this recipe, and I loved how easy and economical it was. You can head over to the Fresh From Florida site and view some amazing recipes with fresh seasonal Florida produce. Be sure to check back often because they update the site with seasonal recipes. Or, next time you are dining out or shopping for groceries, look for the Fresh From Florida logo to make sure that your food selections are fresh, healthy and support your local community. Be sure to connect with Fresh From Florida on Facebook and FreshFresh From Florida on Twitter too! The photo below is curtesy of Fresh From Florida. Pre heat a large sauté pan over medium high heat. Add 1 tablespoon olive oil to the preheated sauté pan. Add sliced onions to pan and cook them for 3 to 5 minutes until almost caramelized. 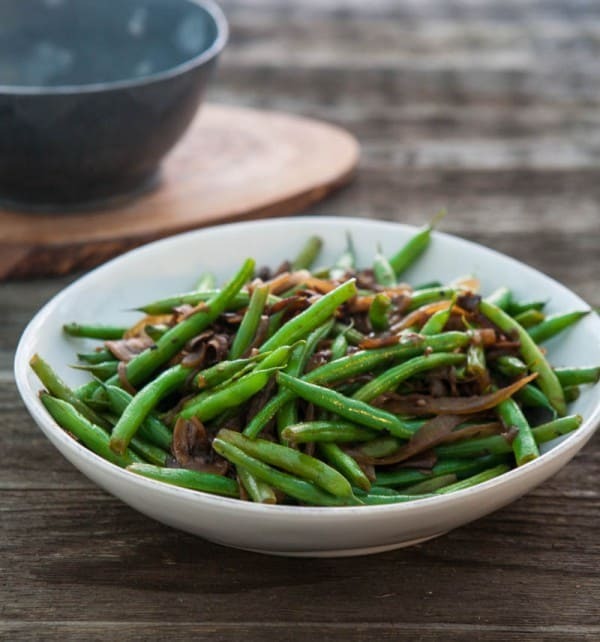 Add the green beans and garlic to the pan and continue to cook ingredients for another 3 to 4 minutes until the green beans are almost too desired tenderness. Add mushrooms, Worcestershire sauce and butter. Cook another two minutes. Taste and adjust seasoning with salt and fresh ground pepper to taste. Remove from heat and serve warm.